Combine your Mechanic Industries products to create highly visual and hard hitting magic. Grindout uses the Joker and blank card that come with The Mechanic Deck as well as a full dollar Grinder Coin. This effect was created long before the deck artwork got anywhere near the printing press. 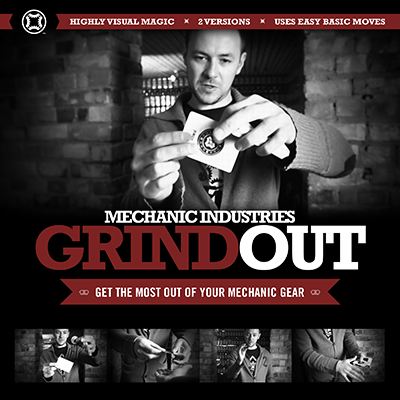 Grindout was 'in built' during the design phase of the first season of Mechanic Gear. The Jokers were illustrated exactly to match the Grinder coins, and utilising the blank card you get with the deck it allows you to perform this visual miracle and many others. We show 2 versions, and they both use just a few basic sleights, combining The Mechanic Deck and a Grinder Coin to full effect. You will be performing this immediately. In both versions you can fairly show the spectator the blank card and coin, as well as hand the deck out after for inspection. You end very clean ready to go into your next effect. The first phase also makes for a great transition from your card to your coin routine. A highly visual piece of magic that see you pull the Joker completely of the card and into the real world, you then take it and smack it straight back on the deck. Totally angle proof version that gets your spectator involved. Not quite as visual but just as powerful. Brought to you by Jimmy K of Mechanic Industries.